Hardwood floors are an investment and by developing habits around maintaining them, they can last for a very long time. Once you get into the routine of the basics of hardwood floor care, it isn’t that difficult. The basics come down to daily, weekly and monthly\advanced care techniques. Establishing this daily routine can add structure to your life and keep your floors looking great and protected. A good dusting with a microfiber mop or cloth is the best way to prevent scratches and surface damage. Microfiber cleaning pads use static electricity to trap dirt, dust, and allergens. Brooms only push dirt around, so they are not superior to a good microfiber pad. One thing to avoid when cleaning with a microfiber pad is raising it off the floor when you clean. Keeping it always in contact with the floor keeps the dirt trapped on the pad instead of floating off when removed from floor contact. Once weekly, you should do a more thorough cleaning. This helps you reach areas that daily dusting can’t reach. 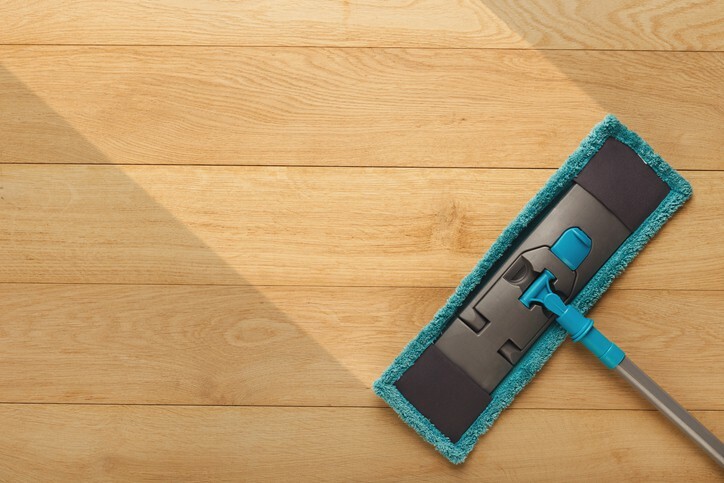 Vacuums and wet mops are the best for getting the dirt out of corners and between each section of hardwood. If your vacuum has a beater bar, you want to raise it to bare floor settings. Having it run any lower can cause scratches and damage surfaces. Be careful with the wheels as well, as they can gouge into the wood if you force them to move instead of letting them easily roll. While using a mop, it is important to recognize that water and wood are not friends. Excess liquid on the floor can absolutely damage the wood and cause it to expand and come out of joint. A light misting is best. Gentle is the word to keep in mind when doing weekly vacuum and mop cleaning. Cleaning products you want to avoid are soap-based cleaners, wax, water-vinegar or steam cleaning. The water-vinegar cleanings will dull the floors by reacting with the floors finish. The soap and wax also dull the finish by leaving a residue. Steam, like excessive water, can lead to cupping and long-term damage. Never steam clean a hardwood floor. Rugs and protective mats can extend the life of hardwood floors and compliment the decor. If you choose to use these, look for ones that have a waffle pattern or natural rubber underlay. Felt floor protectors are good for furniture, as the legs\pegs of furniture can dig in and damage hardwoods if left unprotected. Polishing can be done every 2-3 months with a special hardwood floor polish. This should keep the finish protected and the refills microscopic scratches to even out the floor’s surface. A professional sanding and refinishing can buff out scratches and damage and should be considered every 3-5 years. Sanding and refinishing removes the protective finish and re-applies sealant, restoring the hardwood flooring beautifully.